Watford winger Gerard Deulofeu registered a stunning hat-trick in the Premier League over the weekend and was certain he was the star of the week until Barcelona Lionel Messi showed up to inspire his side to a 4-2 win over Sevilla. Together with Troy Deeney, Deulofeu wreaked havoc at Cardiff Arms Park in a game that saw the Bluebirds succumb to a 5-1 defeat, giving Watford the much-needed three points to climb up to seventh place in the league. The Spaniard opened the bank with a nice finish in the 18th minute before making it two in the second half. The former Barcelona star then netted in another one to give Watford their first hat-trick since 1986. Deulofeu also provided the fourth goal by setting up Deeney for a tap-in, before the Hornets captain scored his second at stoppage time. Deulofeu's game-changing efforts were enough to make him think he was the "king of the weekend" but he soon realized that there was another player to give him competition. Speaking to AS, the 24-year-old said, "I thought I was the king of the weekend until I saw Messi in the Sánchez Pizjuán…"
"He’s an incredible player, I really enjoy watching him. I remember when I was at Barcelona I once played a ball to him like it was a watermelon." "I started over immediately to apologize but he’d brought it down with an incredible touch." 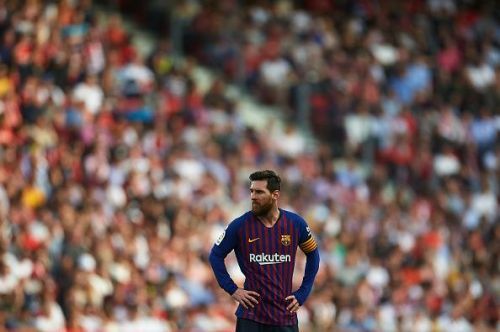 Messi scored his 50th career hat trick against Sevilla last weekend and also registered an assist to help Luis Suarez to his stoppage-time goal. While Watford will next face Liverpool in the Premier League later tonight, Barcelona and Real Madrid will battle it out in the second leg of their Copa del Rey semi-final.